Indoor/Outdoor Armored Tight Buffered is flexible and easy to handle. Light-weight aluminum interlock armor is standard and eliminates the need for inner duct or conduit and the cost associated with the installation of either. Ideal cable for linking buildings in a campus environment. 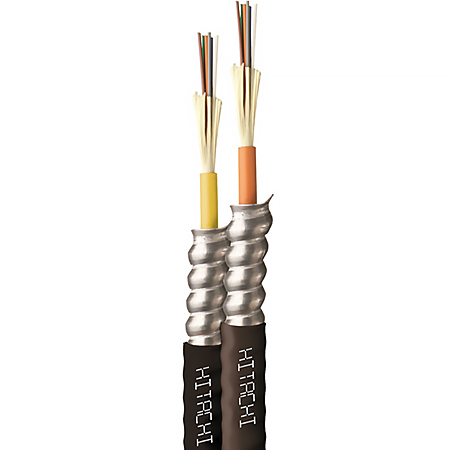 With a plenum rating, this cable can go from outside to virtually any indoor location. Our armored tight buffered cables are both RoHS and REACH compliant. The 900um buffered design allows for easy termination and each fiber is color coded for quick identification. All multimode and singlemode cables (except OM1) utilize bend-insensitive optical fibers. Supported applications include gigabit, 10 gigabit and 40 gigabit Ethernet. Made in USA.